De la Torre, who served in various positions at UC Davis for 16 years, is SDSU’s ninth president. She takes office with a critical November ballot proposal just a couple of months away. The measure, sponsored by the Friends of SDSU, a group independent of the university, is called “SDSU West.” The university’s site plan is actually called “SDSU Mission Valley,” and includes, after the purchase of the current SDCCU Stadium site at a fair market value, the building of a campus extension, a 35,000-seat multiuse stadium and a community hub. 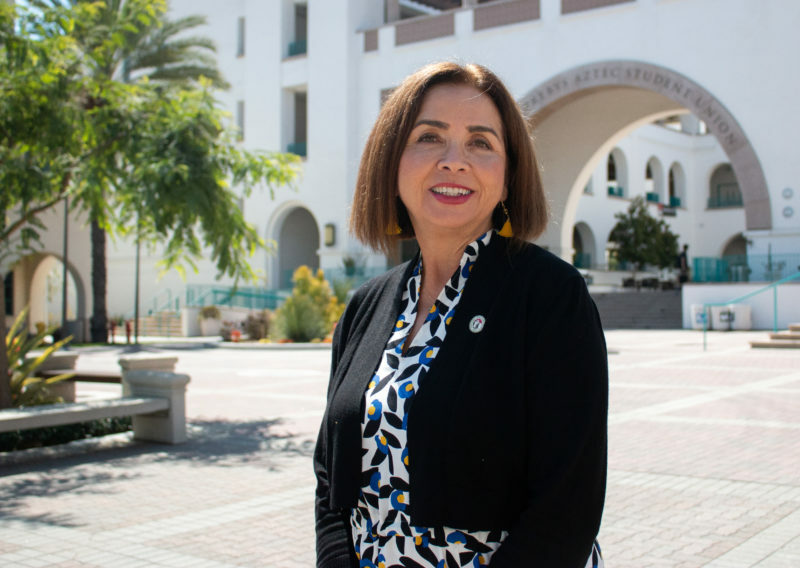 In a recent interview at her Manchester Hall office on campus, De la Torre talked about what she sees for San Diego State, and about her “campaign of listening” to build relationships with the faculty, the students and the San Diego community. What are your priorities as you begin your presidency at San Diego State? I really am prioritizing listening. I have a mantra that I use in terms of my vision, and it really focuses on students. We’re creating global citizens, compassionate leaders and ethical innovators. We have a very special obligation to this community and to these students. Wherever you go, there’s a San Diego State alum. That speaks a lot about not only where we were but where we need to go. We have been as an institution the engine for economic growth and opportunity in this region. What attracted you here, to San Diego State? San Diego State has some of the best faculty in the country. Its reputation I knew about many years ago. This created a great intersection because of my interest in research, my commitment to students and the community part, which is dear to my heart. The culture of the UC is a different culture. I was able to observe it not only at Davis but across the system, that kind of arrogance that would percolate. I saw that in the office of the president, some decisions that made no sense. It is important to be humble for anyone in administration, to recognize that your role is as servant to the people. You make decisions as an administrator, but you have to understand them in the context of impact and conversations and people who are directly affected. Where do you see San Diego State going forward in terms of managing its operation and its growth from a financial standpoint? We need to find multiple-source funds and make sure we have a very important balance of funding. As president, I have to be able to use multiple sources in order to provide opportunities for faculty to get support for the funding to create different research projects, and I also have to be very mindful of the infrastructure. There’s been such a long period of maintenance on this campus. I need to identify and prioritize these, and make sure I’m able to provide the compelling arguments to the (CSU) system so that we have the finances. How important is the SDSU Mission Valley ballot initiative to you and to the university? It’s a once-in-a-lifetime opportunity for expansion. We are really landlocked within the context of the lack of ability to grow for students. It (the SDSU Mission Valley project) provides two opportunities: first, for us to really take our imagination as faculty and as a community and envision something that’s going to put us into the next century; and it’s going to allow us to bring in more students, especially our local students. We need to have more space. Are you optimistic about this vote in November? I’m optimistic if people think of the public good and of the community benefits. It’s not just about land and about money. It’s about community in every sense of the word. If this is a vision for the next hundred years, we have to bring everyone to the table. It’s not just a promise of a few individuals. It’s a promise for the region to create a transformative environment. During your career you’ve been very involved in empowering students of all backgrounds. How do you feel about integrating that mindset of diversity at San Diego State? In the DNA of San Diego State is this amazing capacity to share in ideas. I’m hopefully going to add to that in the context of bringing other elements, such as recognizing that diversity is broadly defined. I’m also very committed to free speech, and I’m a firm believer in the importance of protest. The First Amendment gives us this right to look critically at society and provide perspectives to create dialogue and understanding. Last February, a white nationalist group left fliers on the SDSU campus. How do you balance making sure people have their free speech and also that the campus isn’t disrupted or people aren’t upset? The issue is what are your values and principles, and how do you articulate that? I as president can speak of my support of free speech by enforcing the value of community, to reaffirm the fact that we’re here as a group. We are a diverse group. We support the right to free speech, but we also support the importance of respecting and treating people with civility so that we can work together in a supportive manner. SDSU has really emphasized the idea of entrepreneurship. How do you see that evolving in the years to come? We need to understand that you create the opportunities and engines for students and faculty to get out of the box and in many ways work in partnership with community organizations, with businesses, with entities that are in the real world at some level. San Diego State has the (Zahn Innovation Platform) Launchpad, it has the Zahn (Spirit of Innovation) Award, so I think in many ways we’re far ahead of the curve, and there’s an expectation that we will go further, and we will. It’s really about crossing boundaries that traditionally haven’t been crossed and using your imagination, and I think we do that well across the board. The university has earned a strong reputation as a secondary research university. (SDSU ranks 10th among Latino-serving institutions for the amount of research and development it generates.) Is that sustainable at a California State University? If you were to rank San Diego State, I’m sure it would fall around fourth among the UCs in terms of the faculty and the budget. We have four NIH MERIT (Merit to Extend Research in Time) scholars, which is pretty remarkable. If you take away the medical schools from some of the UCs, we are on a par or above some in terms of NIH funding as well as [National Science Foundation] funding. We’re competing with schools that have medical schools, so to even think of San Diego State as not a research institution would not serve us well, because that’s what we are. I inherited that legacy, but it’s one that is certainly going to grow. What would you like the community of San Diego to know about you? I think what’s really important to know is that I am somebody committed to community engagement. In my actions I will always think about community benefits, and I’m very interested in making sure that all the voices are part of the discussion. I think the other piece that’s important for me, being the first Latina president of San Diego State, is I’m interested in capitalizing on our position as a gateway to Latin America and to Mexico and building those bridges that have been somewhat beaten up in the last few years. We are incredibly positioned to build those bridges and those relationships. For the faculty and students, I am very committed to supporting a relationship of transparency and trust, and making sure that we always have conversations that move us forward in a way that we can collectively agree upon and understand the greater good. Freelance writer David Coddon is also a lecturer in journalism at San Diego State. David L. Coddon lives in Mission Valley. You can reach him at barrettsd@aol.com.